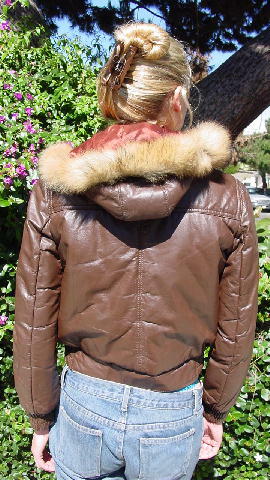 This vintage brown genuine leather bomber jacket has a full front zipper. It has a deep golden brown 100% acetate satin lining filled with 100% polyester. There are two vertical slash pockets. The bottom 2 1/2" wide waistband has two 5" stretch panels (which stretch easily to 6 1/4"). It has long sleeves with 4 5/8" stretch panels. There is a 15 1/4" (front to bottom back) by 17" (side to side bottom) by 5" deep hood. The front of the hood has a 2 1/2" wide raccoon fur trim. The bottom of the hood has a brown string tie. It has a back yoke that extends to the front. side to side bottom waistband 15 3/4"